Vanilla pudding is one of those desserts that people seem to be very nostalgic about. Maybe it was a Handi-Snack tucked into your lunchbox or maybe it was a homemade from-scratch family recipe. Or maybe it was those boxes of JELL-O instant vanilla pudding. 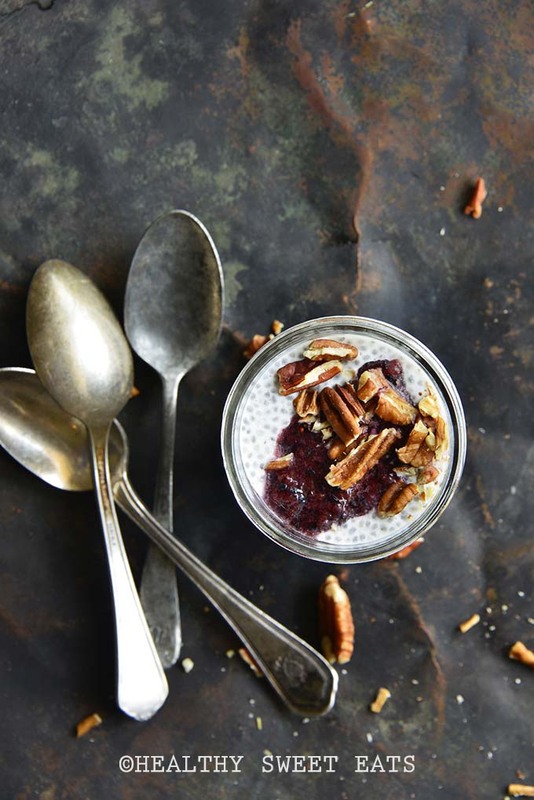 Whatever the reason, if you have a soft spot for vanilla pudding, you’ll want to try this low carb chia pudding. Once you learn the basic method for making chia pudding, you’ll find that it’s easy to make a ton of variations. You can go with chocolate, nut butter, or any fruit that strikes your fancy. Here I made a quick fresh blueberry sauce thickened with a little pectin. 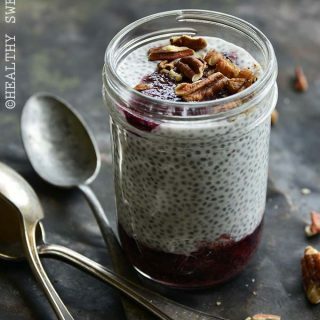 Chia seeds are a good source of fiber and are low in net carbs, so they’re easy to fit into just about any way of eating, whether it’s paleo, low carb, keto, etc. 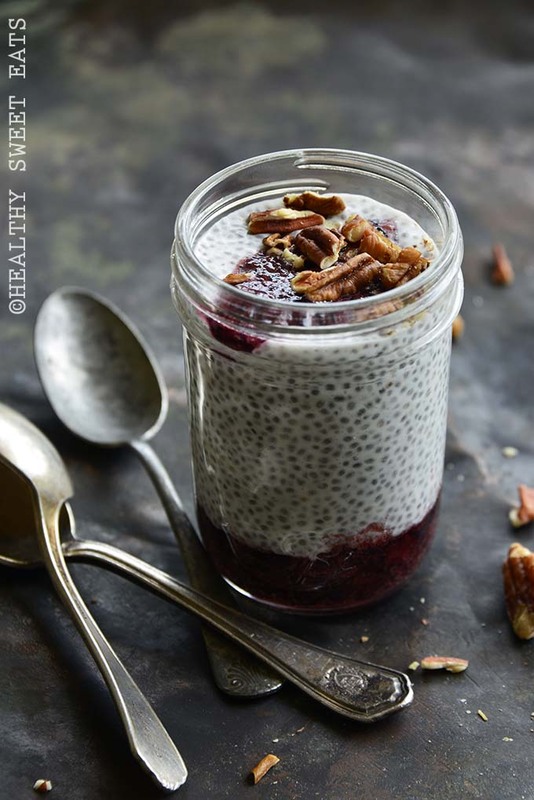 Chia seeds can be a very helpful tool for eating nutritious, real food-based recipes, such as chia pudding. And when you’re trying to lose weight, even though it’s not the full story, calories in versus calories out is also a consideration (read an interesting article on this topic on Healthline). When you make chia seeds into chia pudding, remember that the end result is only as healthy as the ingredients you put into it. In particular, be mindful of the liquid and sweetener you use. For example, if you want to keep this recipe paleo, maybe use coconut milk instead of heavy cream and honey as the sweetener. Or if you want to keep it vegan, almond milk and maple syrup may be good options. Here, I went with a low carb chia pudding option, using heavy cream and stevia. 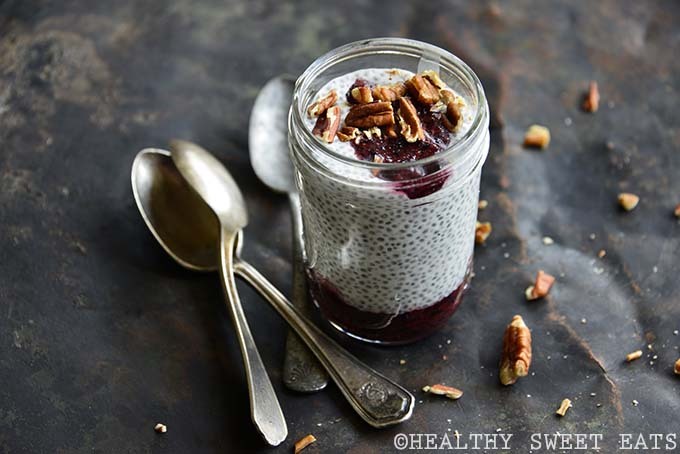 How Long Is Low Carb Chia Pudding Good For? 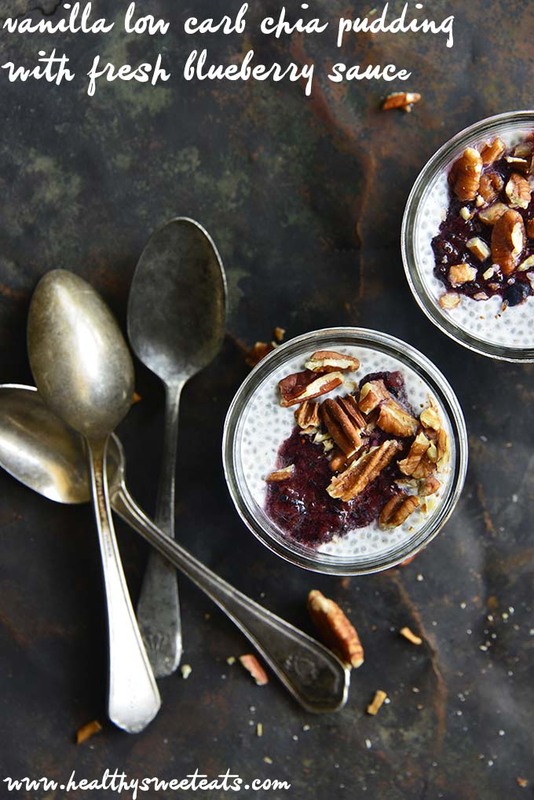 This low carb chia pudding will stay good for up to five days in the fridge. I like to store it in individual lidded glass jars so they’re easy to grab and go. For the pudding, whisk together all ingredients in a bowl. Cover and transfer to the fridge to sit overnight and turn into pudding (give it a stir every so often if you think of it). For the sauce, add all ingredients to a food processor and pulse until it forms a chunky sauce (it will thicken more as it sits). To serve, layer the pudding and sauce in individual glasses. Top with the pecans, if using. Can be stored covered in the fridge for up to 5 days. This hardened in the fridge after only a few hours. It was the consistency of play dough. I have absolutely no idea what happened. I made two changes: didn’t have vanilla extract so I used almond extract and I don’t care for Stevia so I used 1 tsp of granulated Swerve. Any thoughts? 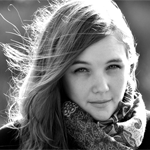 Claire, Oh no, I’m sorry to hear that! Honestly, I have no idea; I’ve never experienced (or heard of) this happening with chia pudding before. If the only changes you made were the two you mentioned, I don’t think it would effect the outcome like this. It sounds like you needed more liquid, but this is quite odd if you used the amount of liquid and chia seeds that the recipe called for!